In our previous tutorial Dragging objects – a very simple HTML5 Canvas example, we looked at a simple example of dragging objects in the canvas with mouse interactions. Here we will extend this example by adding some new behaviors. First, we will change the layering order of the objects every time an object is dragged, so that the currently dragged object appears on top of all the others. Also, we will change the animation technique in such a way to create a smooth motion of the object while the mouse is dragging. Some of the details behind the code were explained in our earlier posting, so here we will concentrate just on how the example has been extended. You should also download the code (or request your browser to show the source on the demo page) to see how it is all put together. If you are not familiar with array methods, here is what is happening in this line: the splice method splices out an array containing one element at the position dragIndex, and this one element (which is at position 0 in this sub-array) is put back into the array at the end using the push() method. Getting the dragged object to move smoothly is done with a classic technique. The mouse position defines the position where the user wants the object to be — call this the “target” position. But instead of moving to the target position automatically, we have the object gradually move towards that position. We define an amount easeAmount, which should be a number between 0 and 1, and on each redrawing of the screen we move the object only this much closer to the target position. In our example here, we set easeAmount to 0.2, which means that on each screen update the object will move only 20% of the distance from its current position towards the target. The variable ratio should range from 0 to 1, and it defines the position along the gradient where this color should occur, where 0 represents the beginning of the gradient and 1 represents the end. Note that in our example, the gradient starts out with radius zero at a position offset by a third of the radius from the center of the circle. At this position, the gradient will be at its brightest value because of the way the colors were created above. 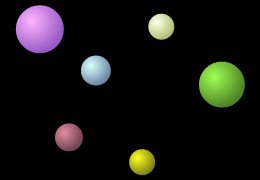 The gradient then reaches its final darkest color at a circle with radius equal to 1.33 times the radius of the circular display object to be drawn (this will cause the final color to be just visible at the bottom right edge of the display object). Thank you for the neat examples. Would it be possible to use an image instead of circles for the moveable objects? I assume it would have something to do with replacing the drawshapes functionality but I am not sure how to modify this.